James Barnet Cole, one of the rescue teamsters, en-route to the relief of the Willie and Martin Handcart Company’s had a dream. What did he dream about? From the life of Catherine Reese Clawson: She was one of the first members of the Relief Society in Nauvoo. She supported her family and in 1848 obtained two wagons with teams and two years of supplies to cross the Plains. Her second son joined the Mormon Battalion, leaving Hiram, age twenty-two, to help with the wagons. Hiram was injured shortly thereafter and had to ride, so Catherine and her two daughter’s ages thirteen and nine drove the teams. Catherine’s husband had disappeared sometime between 1838 and 1841, and is believed to have been drowned in a steamboat explosion on the Ohio River. Her son, Hiram, finally recovered after an old Indian woman taught Catherine how to treat his wounds. 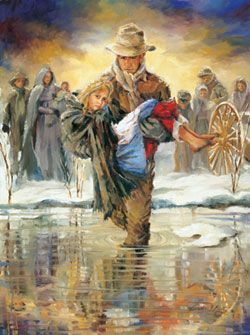 Pioneer Women of Faith and Fortitude, Daughters of Utah Pioneers: (International Society Daughters of Utah Pioneers: 1998), 1: 606.